Palki Grid - Smartphone Review Blogger Template is another newer and update version of Palki 2. Palki Grid is specially designed for Mobile or smartphone review website who running on blogspot. This is a minimalist and clean design. 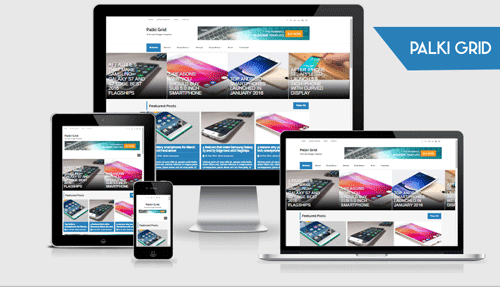 SEO Optimized and responsive blogger templates. If you running a smartphone review or any kind of review website on blogspot, then Palki Grid is perfect for your blog. It is professional blogger template. Palki Grid is a user friendly blogger themes. In this template we used Carousel recent post widget and its also mobile friendly. Palki Grid -its another new and smart blogger templates by MS Design. Palki Grid is a newer version of Palki 2 Blogger template. We design this template grid style for any kind of review website. If you running a smartphone review website, then Palki grid template will be perfect for you blog. This is a minimalist design and search engine optimized. Also responsive and compatible with all smart phone device. In this template we used Carousel recent post widget and Featured post widget with specific label. Hope guys you will love this template. Mobile friendly blogger template is essential for better search result. MS Design always design mobile friendly blogger templates. In this template we added a recent post slider that called Carousel Widget. First 10 recent post will automatically sliding one by one. Another important widget is Featured post. In this template we also used a featured post widget. You can highlight 3 posts as featured post with specific label. Palki Grid Blogger template help you to make a user friendly and Search engine friendly website with blogspot. This template is perfect for every review website. This template is another edition of Palki 2 Blogger template. Go here and know more about this template. If you have any questions about pro version of Palki Grid, then feel free to Contact with us. Nice template... but i like blue apk. Super fast loading and clean... :d.. I don't know barely anything about coding (HTML, JAVA and CSS). My greatest worry is if I'll get full support to design the website according to my needs. Really liked the template, interested on buying it! hi bro.. how shows 'older post' and 'newer post' navigation in post page?? in palki grid template of course..